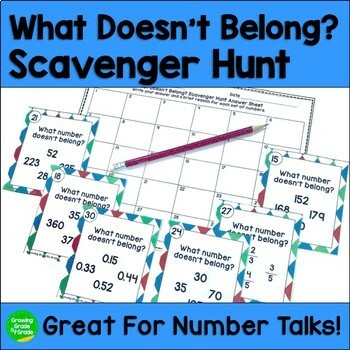 Do you need an engaging number talk activity for your math students? Students will have fun thinking critically and reviewing math as they hunt down the next problem in this helpful What Doesn't Belong? Scavenger Hunt! 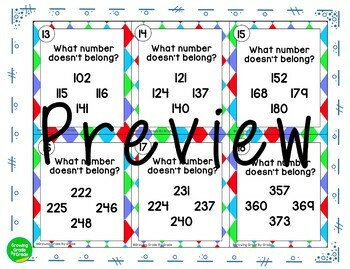 The 30 problems in this product are perfect for grades 4 and 5. 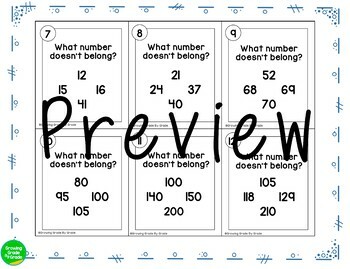 They address Common Core standards and mathematical practices. Standards are not written on the cards, so they'll work for any curriculum! Prep is easy: Print, laminate, cut, go! •Construct viable arguments and critique the reasoning of others. A Scavenger Hunt - With 30 problems, you can break it down over several days! Use the full-color or the ink-saving black and white version! Prep is simple! Just print, laminate, cut apart, and go! You'll use it year after year! How about some more Scavenger Hunts? Deals and discounts are as easy as 1-2-3! 1. Remember to leave feedback on your purchase! You'll earn money-saving points toward future TpT purchases. 2. Follow me to be notified when I publish new products, which I always discount for the first 48 hours after publishing. 3. Please contact me if you have any questions or need help! We're all in this together!